Although the Commission on Women and Gender Equity (CWGEA) released our preliminary report during the final days of the spring semester, we have been continuing to work throughout the summer with UR community stakeholders and the administration to carefully consider and begin implementing our recommendations. We are grateful for the feedback that we have received from the President’s office, the Deans of Arts, Sciences and Engineering and from many of you. If you haven’t had a chance to read the report, we invite you to do so here, and welcome further feedback. The Commission on Women and Gender Equity in Academia has issued a report describing our findings and recommendations related to gender equitable policies and practices at the University. After 8 months of listening, reviewing, and researching, we have identified several key areas that warrant further attention. Although we have been working independently from University administration, we are encouraged by the early efforts to address harassment policies and take an intersectional approach to these issues. However, this is just a start. As a Commission, we are committed to staying involved until these new procedures are in place and appropriate attention is given to the broader issues of gender equity that we highlight in our report. As always, we welcome your feedback on our report, the administration’s preliminary efforts, or any other areas of concern or success. 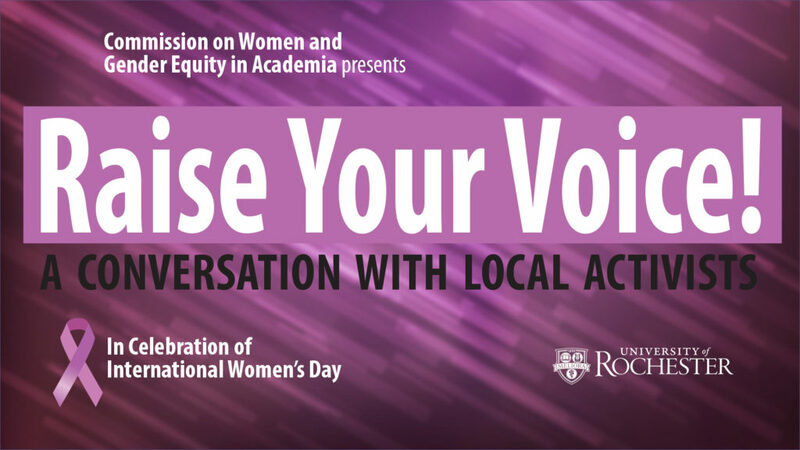 The Commission on Women and Gender Equity in Academia hosted a workshop at the University of Rochester’s Annual Diversity Conference on Friday, April 13, 2018. Commission members engaged and discussed issues with others from around the University community on policies related to sexual harassment and on gender equity and the University policies, procedures, and practices that contribute to a culture of gender inequity, including compensation, support, hiring practices, and career advancement. Still time to provide feedback to the Commission! The Commission’s working groups are hard at work preparing a report of their findings and recommendations. Our members are also actively involved in various University-wide committees to consider and implement changes to relevant policies. We still would like to hear from you about your concerns, experiences and suggestions. Please use our feedback form and visit each working group’s link to see some of the specific issues or questions we would like input on. Below you will find a link to the response of the Commission of Women and Gender Equity in Academia, hereafter “the Commission” to the recommendations made in the report provided by Debevoise and Plimpton, LLP on January 11, 2018. These are intended as initial comments strictly associated with these recommendations, and do not reflect the full spectrum of our concerns related to gender equity across campus. The Commission will report out on other aspects of our work later in the year. For these initial recommendations, we look forward to the opportunity to discuss them in greater detail with the relevant members of the administration, Faculty Senate, students, staff and other members of the University community as the authorized persons and bodies seek to implement changes recommended by the Independent Investigation. On January 23, Commission Co-chair Amy Lerner delivered an update at the Faculty Senate meeting to brief faculty on the progress of the Commission. Further specifics on the Commission’s recommendations will be coming soon. On January 11, the Commission on Women and Gender Equity in Academia met with Mary Jo White and the Trustees Special Committee to discuss the results of the independent investigation and their recommendations. Over the past few months, we have also heard from many members of the community about their own experiences. Sexual harassment and misconduct are a systemic problem that has a lasting negative impact on individuals and communities. We’re still in the process of reviewing the recommendations made by the independent investigation, but from our work so far, we know that at a minimum, the University needs to provide greater clarity about the resources and procedures that already exist, achieve greater balance between confidentiality and transparency, and strengthen policies that address sexual harassment and misconduct. In the coming weeks, you can expect more detailed recommendations from us about how to improve the handling of sexual harassment and misconduct at the University. However, our charge is greater than these issues alone. Sexual harassment will continue until we address the more expansive topic of gender equity. As we stated in our charge, we are actively reviewing all University policies, procedures, and practices that contribute to a culture of gender inequity, such as compensation, support, hiring practices, and career advancement. We look forward to engaging further with the community on these issues in the coming months and encourage you to reach out using our feedback form to bring forward your suggestions for changes. We are pleased to announce the formation of the University of Rochester Commission on Women and Gender Equity in Academia. While the Commission was created at the recommendation of President Seligman, who has also agreed to provide us with staff and financial resources, it was selected and will function independently of the President’s Office and his administration. The commission includes faculty, students and trainees from across campuses and schools and will report directly to the University community as a whole. While the formation of this commission was in response to the recent EEOC complaint, we will not be involved in any investigation of that matter. Instead, we intend to conduct a broad review of the policies, procedures, and culture that affect women and LGBTQI individuals in the academic settings of the University. Our review will include the ample reports and recommendations prepared by previous commissions, and will gather any new information necessary to benchmark and identify best practices. Ultimately, we seek solutions, action, and accountability that will lead to a more inclusive and welcoming community in which all academic members may thrive. Although the Commission members were selected directly by the academic communities that we represent, we recognize that we do not accurately represent the diversity of our community. We will make it a priority to ensure that our working groups, consultants, and advisors do represent the breadth of experience and perspectives of our community. Over the course of our work, we will engage the community directly, and welcome immediate feedback, input or recommendations by e-mail to any members of the commission, listed below. For periodic updates, please continue to visit this website.